This is Yanni's first instrumental release of original compositions in over eight years and is a return to the genre Yanni helped create and advance. On March 22, Yanni launched a 40-date tour of the US. The tour will take him through theaters in major cities across the US including Radio City Music Hall in NYC and the Nokia Theater in Los Angeles. check this webpage for tour dates and to purchase tickets! About Yanni~ In Kalamata, on the shores of the Mediterranean, Yanni was born in 1954 to Sotiri and Felitsa Chryssomallis. The second of three children, Yanni has an older brother and a younger sister. Sharing a deep-rooted love of music, the family spent much of their time playing and singing together. Yanni's parents provided a typical Greek life for the young boy. He grew up fishing, swimming, and going to school like every other boy in his town, with one exception. Yanni was born to compose music. He began to play the piano at age six, but he refused formal piano lessons. As a child, Yanni heard music in his head and he simply wanted to hear it come out of the piano too, so he needed to learn how to play to make that happen. He felt a certain freedom with the keys that might have been crushed under the weight of structured learning. Music was not Yanni's only talent. In 1969, at the age of 14, Yanni broke the Greek National swimming record for the men's 50-meter freestyle event. Although he could have pursued this skill, he chose to travel a different path; one which eventually led him to share his musical gift with the world. His childhood in Greece and his love for his native country gave Yanni his inspiration to compose such songs as "Santorini," "Nostalgia," and "Acroyali." In 1972, with the encouragement of his parents, Yanni left his homeland to attend the University of Minnesota. Between his studies, he played in local rock and roll bands and began to develop his personal musical style using both piano and electronic keyboards to create new sounds. Yanni single-mindedly continued to pursue his passion for creating music. He explored the worlds of electronic music, new sounds and instruments, and composition. He released 2 albums and worked on a third before moving to Hollywood, the film industry capital, where he recorded 4 film scores and released 3 more albums. He also re-released "Optimystique." In 1990, the Dallas Symphony Orchestra accompanied Yanni in concert, adding a new dimension to his unique style and a prelude of things to come. His more recent tour, Yanni Voices: Live in Concert, in 2009 was a big success. Touring all over North America with sold out shows including Radio City Music Hall and full houses throughout Mexico. The tour was nominated for the prestigious Lunas del Auditorio award and was in support of Yanni's Mexican chart topping release: Yanni Voces (CD) and Yanni Voices (CD). Yanni Voces reached #1 on the Mexican Pop Charts and #2 on the over all Mexican Music Charts. A recent DVD release of Yanni Voices: Live in Concert reached Amazon's number one best seller list within the first week of sales and was a fundraising success for PBS. Yanni has proven to have been blessed with both faith and passion in abundance. The album can be found on Amazon for around $11. You can also listen to samples and buy MP3's! 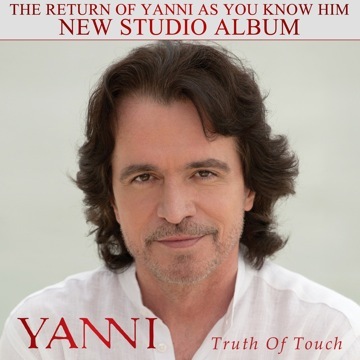 This is a very good Yanni album and shows signs of some growth. Much of the album sounds very "Yanni", but he has updated his sound with deeper bass lines and some synthesizer arpeggios here and there, and a few more modern tricks. It's not overdone and it works. He doesn't lose his signature sound admist all of this, which many artists do when they try this kind of thing. It does take a few listens for the differences in the tracks to come through, and after a few times through some of the songs take on their own character. There are a few tracks with vocals, and a few live instruments here and there, but it's mostly Yanni and the keyboards. It plays a bit like a "best of" album, yet all of the tracks are new. Definitely worth a try if you know you already like Yanni's music. Thanks to the one2onenetwork for allowing me the chance to review the new album! Here from #CommentHour - Interesting review! Haven't heard of Yanni before now; thanks for the intro! WOW! I haven't listened to Yanni for YEARS!! Thank you for bringing him back to mind! I missed @CommentHour tonight, but I still wanted to come by and visit.